Yoshimura Suzuki Factory Racing has reached a multi-year agreement with James Stewart to contest both AMA/ FIM Supercross and AMA Pro Motocross Championships. 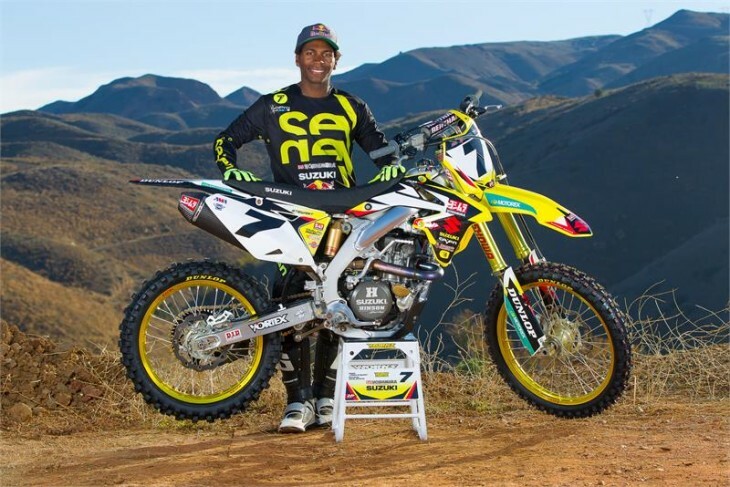 Stewart will compete aboard a Yoshimura Suzuki Factory Racing RM-Z450 beginning with the Redbull Straight Rhythm in Pomona, California on October 11th, the Monster Energy Cup in Las Vegas on October 17th and then in the AMA Supercross and Motocross Championships beginning in 2016. Stewart boasts a Hall of Fame worthy credentials – a multi-time AMA Supercross and Motocross Champion as well as AMA Athlete of the Year award winner; in 2014 he became the first rider in 450 Supercross history to win at least one Supercross Main Event in 10 consecutive seasons. He extends his time with a manufacturer in Suzuki and a team in Yoshimura with rich traditions of winning championships. Teamed with up-and-coming rider Blake Baggett, Yoshimura Suzuki looks to have one of the most impressive rider line-ups in AMA Supercross and Motocross. Stewart will once again be racing Suzuki’s powerful and agile-handling RM-Z450 and Yoshimura’s Supercross/ Motocross Team Manager Mike Webb is looking forward to having him back on the machine.